Our Brisk Multi-Spark Spark Plugs are designed to deliver 3 simultaneous sparks without any modifications to your ignition system. This unique patented design is beneficial for high performance and racing applications, and everyone who is seeking more full and complete combustion cycle as there is no shrouding of the sparks. By having the Multiple Sparks unshrouded, the multi-spark spark plugs have direct access to the fuel / air mixture which produces a more spontaneous and rapid flame propagation. This improves engine efficiency as there are less imperfectly ignited cycles (reduction in emissions from unburnt fuels/air) which is beneficial for racing and performance as well as a producing an economically friendly product. See our video demonstration for a real life view of how this product works. 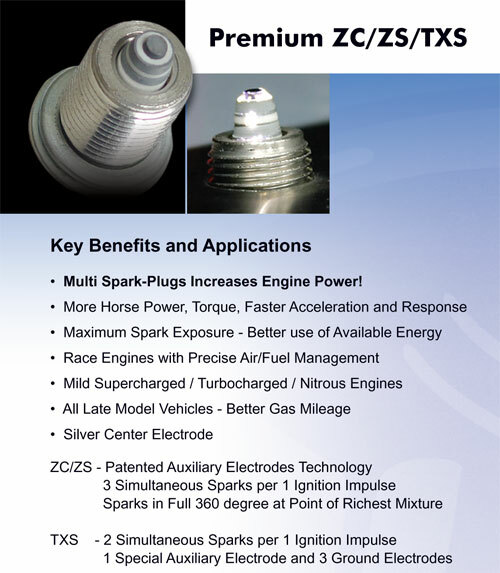 BRISK Multi-Spark Plugs is the only spark plug in the world that produces 3 sparks per one ignition impulse. The Spark Plug has 3 gaps that are arranged in a series. This means that spark has to travel over all 3 gaps in order to reach the ground (spark plug shell), as this is the path of least resistance. Having 3 sparks ignites the mixture faster, and produces power. Do not mistake the BRISK Multi-Spark technology for spark plugs with multiple ground electrodes, as these gaps are arranged in a parallel. With multiple ground electrode spark plugs the spark only jumps one of the gaps in order to reach ground in the path of least resistance, producing only 1 spark per ignition impulse. BRISK Unique and Patented Multi-Spark design not only generates 3 sparks from a single ignition impulse, but, it also eliminates the need for spark plug indexing, as one of the 3 sparks always occurs at the very tip of the spark plug. None of the sparks are shrouded by traditional style ground electrodes, therefore the need for indexing (orientation of traditional ground straps in a specific direction, to reduce spark shrouding) is not necessary. This unique design also requires no gapping, because the auxiliary electrodes are manufactured as part of the ceramic porcelain. Each of the 3 sparks that is emitted can occur any where in 360* circumference on the firing end of the spark plug. This allows the sparks to occur in the path of least resistance, where pressures are lower. This makes it easier for the spark to successfully jump the gap and raises combustion potential and efficiency. Having multiple sparks which occur simultaneously in different locations, creates 3 simultaneous flame fronts, resulting in a more rapid and complete combustion of the available air and fuel. 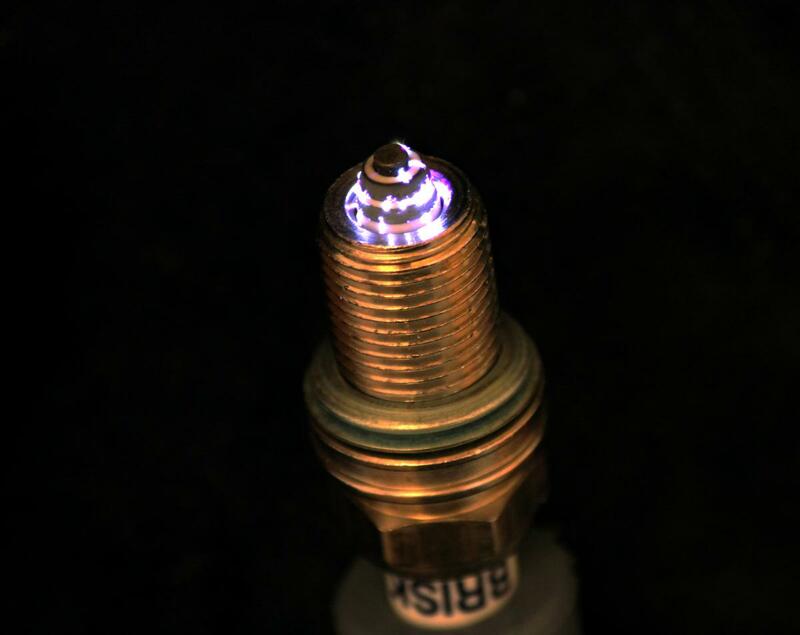 The BRISK Multi-Spark Plug has 3 gaps that are arranged in a series, which creates 3 simultaneous sparks in 360* circumference of the firing tip. By eliminating the need for the traditional style ground electrodes, the sparks are completely exposed directly to the air / fuel mixture in the cylinder. Each spark ignites simultaneously, which increases the rate of combustion and decreases the amount of air / fuel wasted (unburned / incomplete combustion). This results in better utilization of available energy and increase in power and improved acceleration.